28 Comments on "Air Conditioning"
I could have gone on about the huge energy costs of designing buildings to be continuously heated and cooled by air conditioners. However I thought the underlying psychology of why people feel they NEED to fortressed from the elements is more fundamental. These thoughts from a whipper-snapper in Brisbane, Australia, by the way. you are indeed a whipper snapper and rabble rouser. Thanks Stuart. Perhaps we should post a link to Gabriel’s article in the Courier Mail. So glad you have the huevos to speak out! I write from India. Here, in most urban areas, the temperatures vary between 29 to 45 degrees Celsius. The air-conditioners, however, are set somewhere near 18 degrees. Which, as a tropical being I tell you, is freezing. Now after spending several hours in these unnatural climes, we step out into the heat. Our lungs and bodies are taking an obscene blow. As someone who despises the smell, the texture, the silence, the snobbery, the impacts and the concept of air conditioning, I am enraged that I have no choice – most constructions and buildings have windows that aren’t designed to be opened. As I type, I’m eying a chair I’m tempted to fling through my office window. so when you made this, you were outside? when you posted it, you were outside. granted you could have posted it via a wireless connection. a wireless connection developed in a temperature controlled room. that really strikes a chord with me. Terrific work. Henry Miller wrote a book called The Air-Conditioned Nightmare. I don’t remember much about the book, but I often think about its wonderfully memorable title. Love the cartoons. This one particularly. I love the rain when I’m walking in Scotland. I know it can make things uncomfortable for us. But I always remember that it would not be such a beautiful place if all we had was sun. Another wonder of rainy days is descending from the clouds after hours without views. That first glimpse of the other side of the glen, the subtle colours and the sense that somehow the landscape works. That is a feeling that I wouldn’t miss for a lifetime of dry nights indoors. Nice strip, but I’m pretty sure old people would rather feel alive too… and a lot of them die during the summer. A/c is essential, an accessory to climate, not a climate-killer. This is a great piece. I particularly support the bottom-most section. I find thoughts of wonder and appreciation for the beauty of nature when I expose myself to what our planet has to offer – such as the weather, the sights and sounds of life on earth, the hues of sunrise and sunset, the moon, and the subtle accompaniment of the distant stars. You don’t live in the southern United States, do you? Yes, we need to be out in the natural elements more. Moderation in all things. My cute blonde Polish born wife (hi K!) insists on no a/c however hot and humid it gets in NYC, ie 100 degrees and 100% at times. Amazing how one adapts! Hot hot summer nights and cold winter snow blanketed afternoons – the contrast itself is a boon. Love it. I spent 6 weeks in the Philippines and Hong Kong this summer and I’m not a big fan of the use of air conditioning there. I never turned in on in those weeks. But I did use an electric fan… and I was sometimes happier to be in an air conditioned library, mall, museum, etc. So while I do think we’re too self-indulgent and wasteful, I’m completely against air conditioning and heating. I sure wouldn’t want to heat houses with wood or coal fires. Thanks for your great cartoons, btw. Typical shortsighted world view. It’s all about you isn’t it? You don’t need air conditioning. I don’t need air conditioning. I am 30 years old, healthy, and live in relatively temperate New York. However, in air conditioning allows hundreds of millions of elderly, sick and young to pass their years in comfort instead of extreme deprivation or stress. Air conditioning is the largest single factor in the 20th century push to populate areas like the American SouthWest and Texas, which were basically uninhabitable previously. Next time you want to think the world revolves around you and your issues, take a note of how many poor indigent 70 year old black women in inner cities dies during a heat have in summer when they cannot afford cooling. Another great insight Stuart. Keep up the great work. 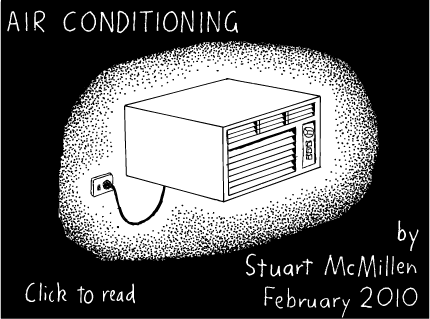 I must be a wuss, Stuart, I like air conditioning, but at my advanced age and decrepitation I don’t do much outside anyway. Love your insight and your cartoons. My favorite one is the Huxley vs. Orwell you made several years ago. $50 says the author did this work in either a cool air conditioned office or a heated office. Pile of crap. when did we decide to be the same temperature at all times? not sure exactly, but I’m guessing it was several million years ago.